Provide consulting services for laser welding and laser cutting since 1992. One of our first projects was the 'laser-specific design of a car door', which is presented here as an example. Laser material processing is one of the key technologies that enable an improvement in production technology. In industrial manufacturing, therefore, increasingly use lasers for welding and cutting. In planar machining operations, especially in laser cutting, they have now taken a considerable share, which is covered partially by job shops. 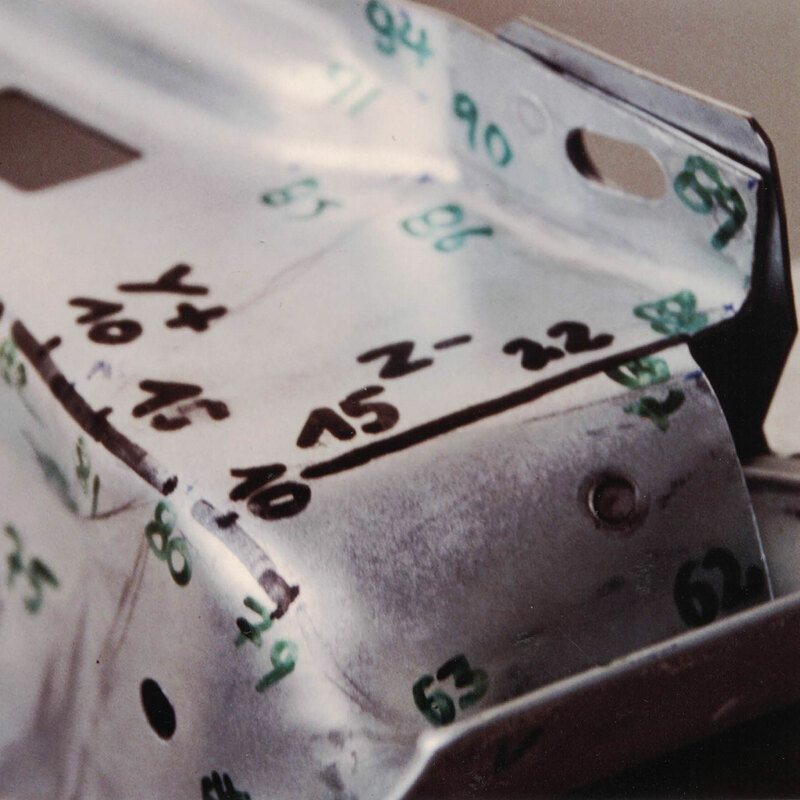 For reasons of quality assurance, however, laser welding is usually carried out in-house. A previously mechanically hemmed car door had to be welded watertightly along the hem with a 5 kW CO 2 laser. 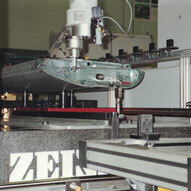 Suitable seam types had to be selected and the door inner parts had to be redesigned to allow accessibility of the robot-guided laser head to the weld seam. The geometry of the components should allow the welding robot to reach the weld. 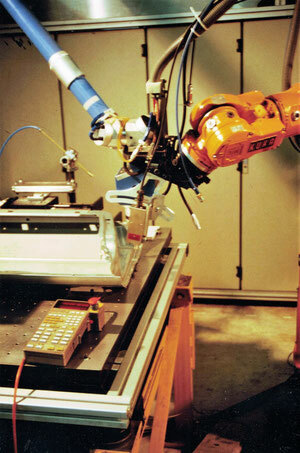 The contours of the welding path should be designed in such a way that they could be reliably tracked by the robot - e.g. by means of a seam following sensor. 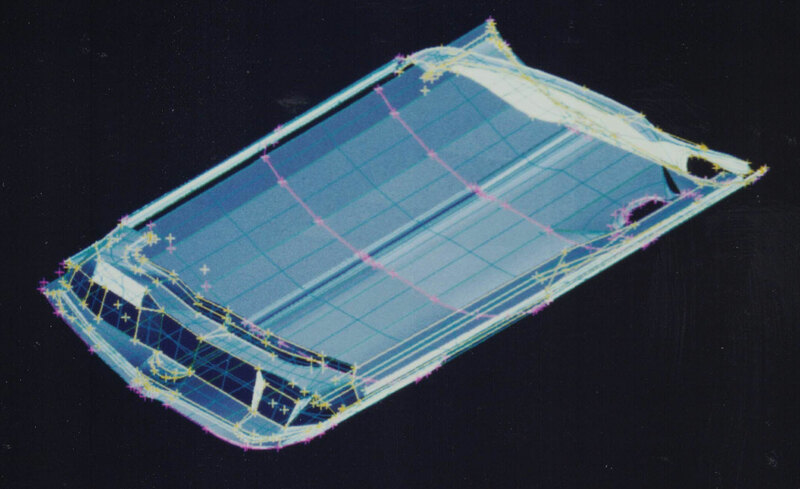 In many cases it is necessary to perform a collision analysis already in the CAD model. Car door. The outer skin is mainly produced by the 5 violet rendered Bezier splines. 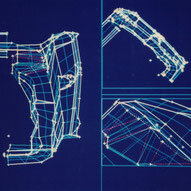 The internal parts are simulated by yellow Bezier splines. They lie in this view ontop of the outer skin. The patches spanned between the splines have green borders. On the patches run blue isolines. These are parameter lines that arise, when one of the two linearly independent area parameters u or v is kept constant. In order to increase the transparency on the outer skin, only one isoline pair per patch was shown in the picture. The punched holes were not recorded. Likewise, the modeling of the rear view mirror carrier was dispensed with. The holes of the side impact carrier and the hinges were represented by dots. For the collision analysis, in the first step critical areas were marked on the inner parts of the door and numbered measuring points were recorded. 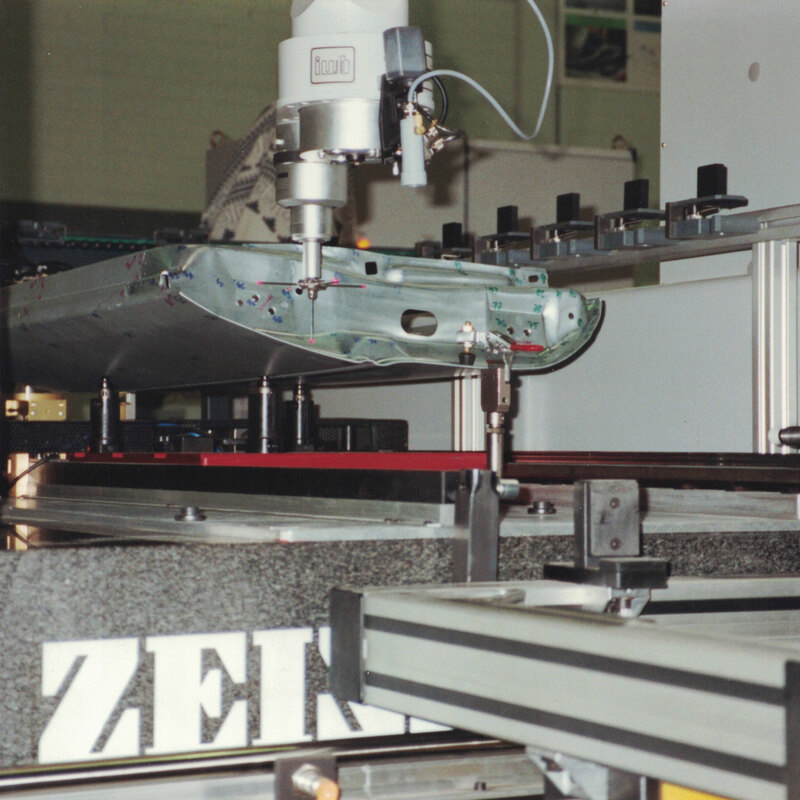 With a CNC-controlled three-dimensional Zeiss coordinate measuring machine, the xyz coordinates of the point cloud were measured. With Euclid 2.1, a meshed 3D CAD model was created, which was then imported into the collision analysis simulation program USIS. For example, in the area of the front upper corner of the door, the welding seam with the laser welding head could not be reached with an inclination of 20 °. The collision areas where, therefore, marked in black on the door inner panel and the dimensions were indicated, by which the sheet metal surface should be moved. A shift of y ≤ 15 mm to the rear and z ≤ 22 mm to the outside was necessary to ensure seam accessibility. In laser welding, high accuracies are required because the focus diameter of the laser is very small and therefore must be precisely positioned. The heat conduction causes a thermal influence on the workpiece during welding. through which the workpiece expands in places. This expansion must be taken into account when choosing the dimensional, shape and positional tolerances. 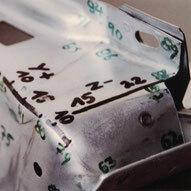 The fillet weld shown on the left is advantageous, because the material can flow during melting. Similar to the use of filler material in conventional welding, this causes a uniform temperature distribution. Namely, a balance is formed between the volume of the melt and the supplied energy, which causes a constant adjustment of the temperature of the melt. However, the required inclination of the welding head of 20° towards the inner part leads to conflicts, when large windows are to be accommodated in the door. 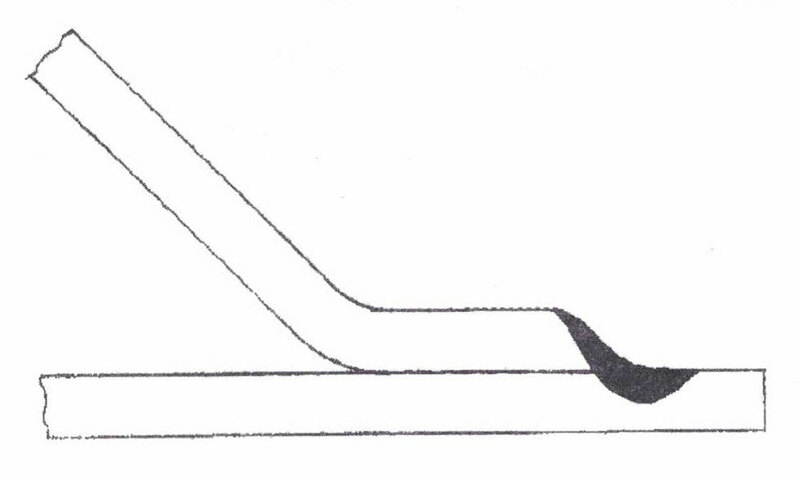 In comparison to overlap welding shown on the right, the fillet weld requires less energy for the same welded cross-section. As a result, higher process speeds and less heat distortion can be achieved. In areas that can not be accessed with a sufficient inclination of the welding head without colliding with the inner parts due to the shape of the inner parts, can be created well with the help of holes well remedy. Although this type of seam can transfer forces, it does not work because it is not waterproof. If the deepformed sheets are sufficiently elastic to transmit resilient forces, it would be possible to make first the fold and then push the door inner parts underneath. 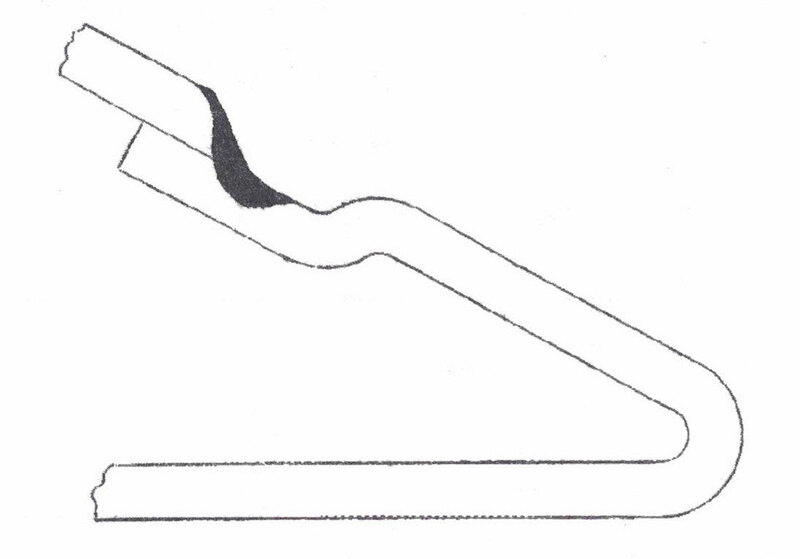 In this case could the parts would not need to be pressed together during welding, because the joint gap would be kept sufficiently small by the pressure of the fold. To avoid problems during installation, in this case, at least three internal parts should be provided: If the front and rear inner parts should be inserted into the corners of the door first, then the upper part could be placed between these parts. This component Joint is already used in plastic bodies of French manufacturers. doors and tailgates are assembled in this way using screws and adhesives instead of laser welding. They are easy to join because they compensate even large tolerances. However, because the sheets used in laser welding are much thinner than the corresponding plastic parts, this seam shape does not seem suitable for sheet metal constructions due to the sensitivity to bending on the sheet edge and because of the risk of injury. In addition, the effect of the heat probably changes the zinc layer of the outer skin, which would also be visible after painting. It should be assessed, whether the heat will be dissipated well enough. This component design is already used in plastic bodies of French manufacturers. Doors and tailgates are assembled in this way, which are easy to join because of the large tolerances. However, adhesives and screws are used for joining instead of laser welding. As the sheets used in laser welding are much thinner than those of the corresponding plastic parts, this seam shape does not seem suitable for sheet metal constructions because of the sensitivity to bending on the sheet edge and because of the risk of injury. In addition, the effect of the heat would probably change the zinc layer of the outer skin, which would be visible even after painting. Preliminary tests to assess, whether the heat will be discipated well enough, would therefore be absolutely necessary. Since this is a fillet weld in a lap joint, the zinc fumes produced during welding can easily escape. Especially in conjunction with a pressure roller, or better pressure ball, this is an elegant and robot-friendly way of welding car doors.